Surrender nightclub in Las Vegas is a lavish dance club and lounge known for showcasing some of the world’s best electronic music talents. In addition to an immaculately-decorated main room, the club features plenty of poolside seating, pole dancers for entertainment, and a premium sound and light system designed by John Lyons. The club’s bottle service is also on point. Enjoy bottle after bottle of your favorite alcoholic beverages while being catered to like a rockstar. If you have yet to visit Surrender nightclub in Las Vegas, here are just a few good reasons why you should. What Does Surrender Have to Offer? Surrender offers upscale entertainment in its indoor/outdoor spaces that span more than 45,000 square feet in total. Outdoors, the lush environment is adorned with large palm trees, three tiered swimming pools, and more than 120,000 LED lights which create a sensual ambiance. You’ll also find numerous cabanas and bungalows that allow you to take your group outdoors for parties and special events. The deck also has couch settings, day beds, and lily pads that float in the water for your lounging pleasure. Whether you’re there with a just a couple friends or want to reserve the outdoor area for groups of 200 to 500, Surrender can likely accommodate your needs. When it comes to bottle service, you have two main options. You can choose to reserve a table indoors on the dance floor or one on the outdoor patio or poolside. 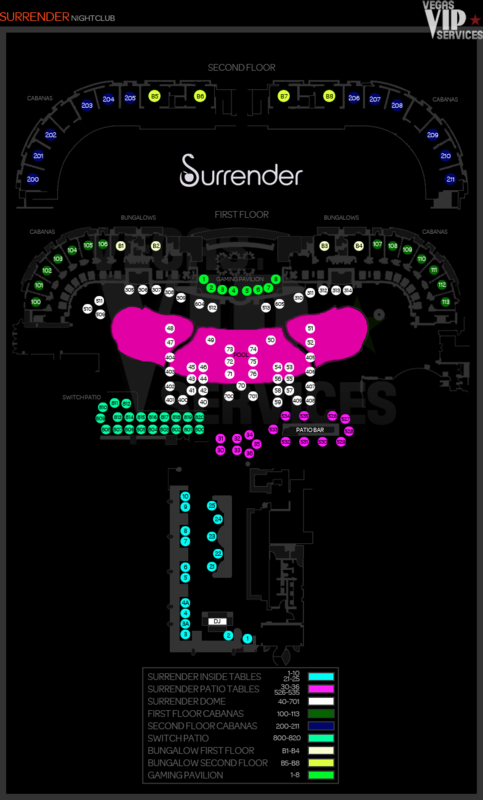 Unlike most clubs which have tables found throughout, Surrender primarily has tables directly on the dance floor which keeps party-goers near the action at all times. While a corner booth is best, nearly any table on the dance floor will leave you satisfied. If you want the “best” table in the club, choose the one located next to the DJ booth near the back wall. This premier spot puts you in the middle of the action. At Surrender, you can expect to have a table minimum of at least three bottles, which cost about $525 each on a typical night. Table service may run more on weekends, holidays, and during special events. Outdoors, table prices are a little more affordable. The party typically gravitates to the outdoor pool deck early in the evening and moves indoors as the main DJ performs later in the night. If you want the best bang for your budget, consider a cabana rental. When you split the cost of a cabana with a large group, you can keep the bottles and mixers coming all night long. In addition to a fully stocked fridge, your cabana rental also comes with your personal wait staff and security guard. The cabana is also equipped with its own private bathroom for your party, as well as a flat screen TV that streams the action going on at the DJ booth directly to your cabana for your viewing pleasure. Choose a cabana located on two different floors. Can I Celebrate a Party at Surrender? Surrender is the perfect place to host a bachelor party, bachelorette party, birthday party, or any other type of celebration. The nightclub often offers special bachelorette deals on Wednesdays and some Fridays for bottle service, making it the ultimate place for groups of young ladies to go for a good time. Surrender is open on Wednesdays, Fridays, and Saturdays from 10:30 pm to closing. A strict dress code is enforced and prevents guests from wearing sandals, bagging clothing, hats, shorts, and athletic footwear. If you’re interested in visiting Surrender, be sure to reserve a table early on. 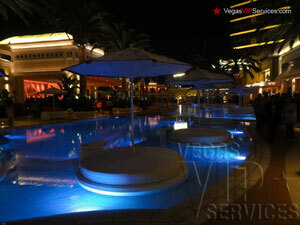 Contact Vegas VIP Services to reserve your Bottle Service at Surrender Las Vegas. Surrender Nightclub is open Wednesday to Saturday, from 10 p.m. til late night. Dress code is strict, so dress to impress. Bottle service is recommended to have a place to hang out and not be pushed away from section to section. Steve Aoki, resident DJ, hosts a dynamic live performance. The DJ booth and audio system were designed to withstand outdoor elements while delivering exceptionally rich, clear sound. There’s an eclectic décor, expansive bar, and an all-encompassing chill vibe for the entire venue. As day turns into night, Encore Beach Club transforms into Surrender Nightclub. Surrender wasted no time, becoming the hottest new addition to the smoking hot Las Vegas nightclub scene before it even opened. 5,000 square feet of intimate club space is jam packed with hot bodies and gorgeous eye candy. The ever-impressive Wynn Las Vegas and second run, Encore, raised the bar for nightlife standards with Tryst and XS, respectively. Memorial Day Weekend 2010, Steve Wynn unveiled his newest creation: Surrender. It is a night time pool party, you can actually get a cabana for 4Gs at night but how much fun is that? it is no better than XS, it should be cheaper too, way too expensive.